Steam Excursion Trains "Down Under"
While on vacation this past December, Werner and Ann Balsterholt visited Australia and New Zealand. While there, they took trips on two restored steam trains. Located in Gisborne, New Zealand is the Gisborne City Vintage Rail. Brochure details: Wa-165 is the sole survivor of 11 locomotives built between 1892-1903. Restoration started in 1985 when a group of Gisborne rail enthusiasts formed a society to restore the train. Work started in 1986, and was completed with the first fare-paying passengers on Labour weekend of 2000. Wa-165 is one of the most scenic rail rides in the country. 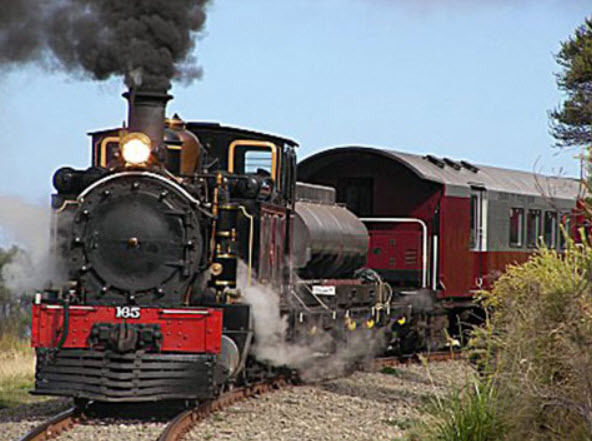 Rail enthusiasts, can relive the romance of steam travel on a trip to the village of Muriwai and back. To see Werner’s photos of the Gisborne City Vintage Rail, click HERE. 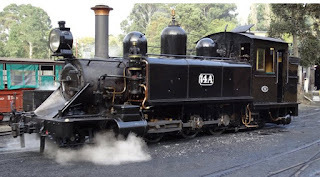 Located near Melbourne, Australia is Puffing Billy Railway, Australia’s premier preserved steam railway. Built in 1900, the train carried anything from passengers, timber, potatoes, and plants. It is the major survivor of four experimental narrow gauge (2’ 6”) lines used to open up remote areas of Victoria. Puffing Billy runs on its original mountain track between Belgrave and Gembrook. To see Werner’s photos of the Puffing Billy Railway, click HERE.